BayernLB, the German state bank, is suing Bernie Ecclestone and his family’s Bambino trust for €345 million ($422 million) over the Formula 1 major domo’s role in the controversial 2005 sale of the bank’s share of the series. Ecclestone, in response, has counter-sued the bank for an undisclosed amount. The Bayern suit, announced in Munich on Friday, is the latest in a string of lawsuits over F1’s sale to an investment group. A Bayern executive went to jail for 8+ years in connection with the sale, over charges he solicited a $44 million bribe from Ecclestone (who paid it). Ecclestone agreed to pay the Bavarian government a $100 million “settlement fee” last summer to make fraud charges against him in connection with the matter “go away.” He faced up to 10 years in prison if convicted. 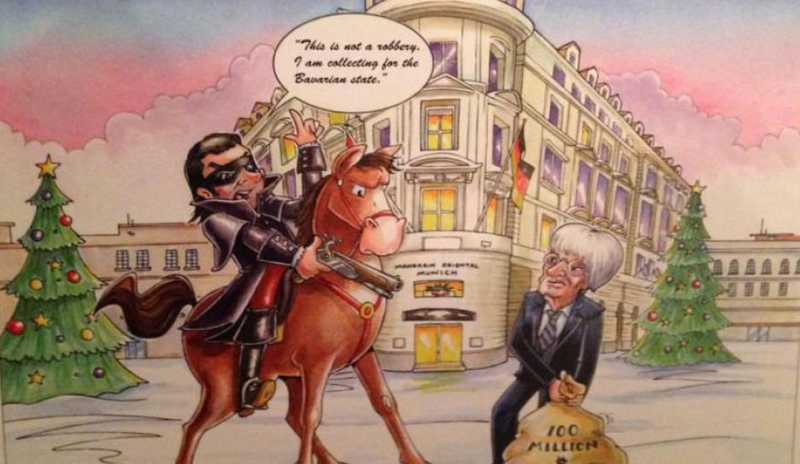 Ecclestone lampooned that payment as a form of highway robbery in his annual Christmas card (shown above). Bayern and Ecclestone have been engaged in settlement talks over the matter; Ecclestone reportedly offered the bank €25 million in cash last August. The bank said it refused the offer, then filed its suit. 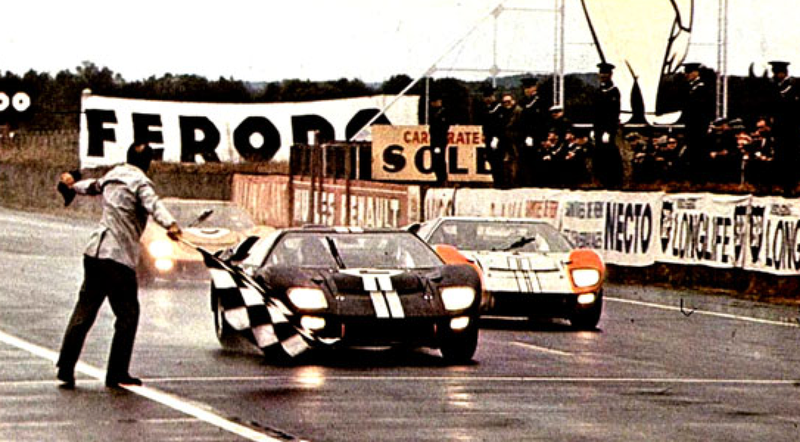 Ford GT40 winning 1966 24 Hours of Le Mans. Ford Motor Company is reportedly planning to resurrect its GT supercar for production, and to also commission racing versions that would compete in the 24 Hours of Le Mans in 2016. The GT, evocative of Ford’s legendary 1960s GT40 sports car that won Le Mans four times 1966-69, was a limited edition model that was produced in the 2005 and 2006 model years. The car, plagued by initial quality issues and a $150,000 price tag, was discontinued after that, although it reportedly took some dealers into 2007 and 2008 to clear their lots of unsold models. Since then, however, the GT has become something of a cult collectible. While details remain hard to pin down, a press conference has been scheduled by the FIA’s World Endurance Championship, a series affiliated with the Le Mans race, for Jan. 13 in Detroit in connection with the North American International Auto Show. Ford may or may not announce its GT plans at that time. 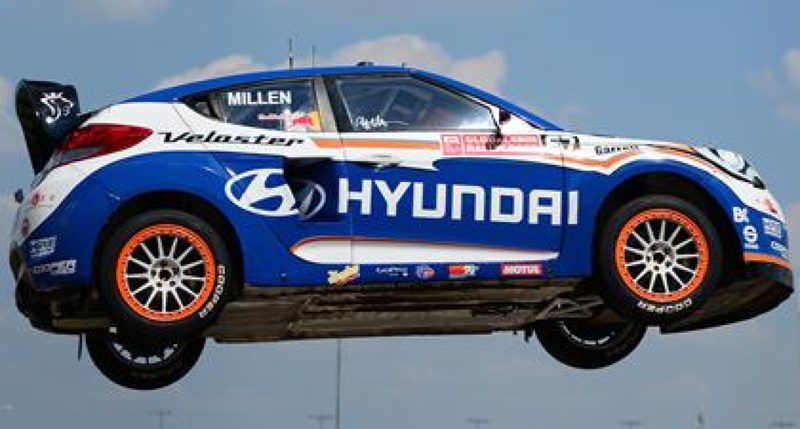 Meanwhile, Hyundai is apparently ending its North American motorsports program, after withdrawing from its six-year partnership with Rhys Millen Racing. The partnership had fielded entries for the Pikes Peak Hill Climb, Global Rallycross and Formula Drift. « Is This The 2016 Toyota Prius?